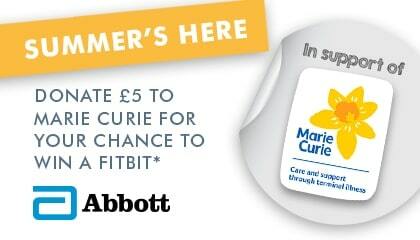 Win a brand new fit bit and support Marie Curie! Summer is here, so now is the time to track your steps and get out to enjoy your surroundings. Starting from Monday 17th July, you could be in with the chance of winning a fitbit! We have linked up with our brand new tenant Abbott to offer 5 lucky people the chance to win….and all you have to do is donate £5 to our Marie Curie just giving page to be in with a chance! Keep your eyes peeled for more information over the coming weeks and be ready to enter.